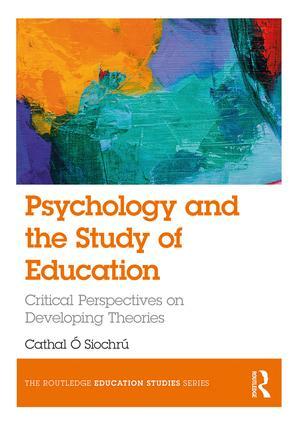 Psychology and the Study of Education: Critical Perspectives on Developing Theories explores both the insights and applications that psychology can offer in a range of educational contexts. Introducing the reader to a wide variety of sources, from cutting edge research to key studies from the past, it offers new perspectives on the psychology of education. This includes re-examining core theories of learning, unpicking key learning processes and reconsidering the role of factors such as memory, creativity and gender in learning. Questioning myths and misconceptions, it challenges the reader to develop a critically reflective approach and asks them to reconsider the potential value of psychology in both understanding and influencing education. Reconsidering what we think we know about the psychology of education. Memory: How we learn by remembering and imagining. Creativity: Creative learning and learning creativity. Reading, writing and dyslexia: Understanding the myths and exploring the challenges. Embodiment: The entanglement of brain, body and environment in learning. Social understanding: Learning to relate and its role in education. Gender: The origins of gender identity and its impact on education. Behaviourism: Taking a second look at its wider relevance to learning. Piaget: A fresh perspective on Piagetian theory and method. Vygotsky: Socio-cultural theories and collective learning. Your guide to the complex and evolving field that is psychology of education, this is an essential text for students of Education Studies, Disability Studies, Early Childhood or Childhood and Youth Studies and Teacher Education; ideal for anyone who has already been introduced to a little psychology and would like to know more, or anyone teaching psychology on an education course. Whether you are taking your first steps or looking for your next challenge, this book has something to offer anyone who wants to take their study of the psychology of education to the next level. Cathal Ó Siochrú is Senior Lecturer in Education Studies at Liverpool Hope University, UK.